It’s time to explore the next level in pet training. We are going to look at the Petsafe Basic in-Ground Pet Fence PIG00-14582. Petsafe PIG00-14582 is perfect for most pet owners. It covers a large area and has a great proven system for training your pet in only two weeks. 1.1 What Benefits Petsafe Basic in-Ground Pet Fence PIG00-14582? 1.2 How To Install Petsafe PIG00-14582 wireless dog fence? Designed for all weather you will be able to begin right away. There are multiple levels of correction and an expandable format for spaces up to five acres. Visual and audio clues also allow for several levels of connection. Easy, simple, and structured. Proven from years of use you will enjoy the ease of use. Meant to be set up over just a weekend you won’t have any problem getting the process started. Waterproof collar with waterproof receiver means weather will not be an issue. The benefit of this high quality well designed system is it can handle multiple pets with the purchase of multiple collars. The number is unlimited. Take a minute to explore the main features, benefits and installation steps right now. Dog owners who like to keep his dog in the yard. Dog neck size should be between 6-28 inches. Who have a custom yard for his dog. but not circle. What's Included with Petsafe in-Ground PIG00-14582 ! Wire is not enough for Too big yard. You will need to purchase extra wire. The Petsafe Basic in-Ground Pet Fence PIG00-14582 is Designed for dogs eight pounds and over. Virtually any dog over miniature size and puppies are covered. You’ll get a transmitter with the included power adapter. Along with RFA-68 battery powered receiver collar for one dog. The good news is you can purchase as many extra compatible collars as you want. They will all work along the same fence. This System has a unique collar supports from 6 inches to 28 inches neck size of your dog. So it will appropriate from small size puppy to big size dog. Sometimes you have a short hair or long hair pet. Not to worry as short and long contact points are provided for them. Petsafe Basic in-Ground Pet Fence PIG00-14582 is very flexible and adjustable with your favorite dog. It understand the temperament of maximum dogs. Depends of dog nature it has different 4 levels of static corrections. So you can increase corrections gradually depends on how stubborn the dog you have. In addition it comes with fifty training flags to use around the boundary. This gives a visual boundary for your pets to remember where the boundaries are without crossing them. Perfect as dogs are territorial based on sight. Also has five hundred feet of twenty gauge wire for the boundary exterior. Plenty of room to choose the area to allow your pet or pets to roam free. You don’t have to use all of it but it’s there if you need it. The twenty gauge wire is heavy duty enough to handle easily as you install the fence. Petsafe Basic in-Ground Pet Fence PIG00-14582 has warning tone along with Static corrections. For very obedient dogs, Warning tone is enough to keep them stay in the yard. Along with the ample durable boundary wire you will have the included surge protector. This is for power surges within the system to keep from damaging the fence itself. No matter where you life you’ll be able to use the fence with protection from interior power surges. Your pets won’t know the difference as they become conditioned but you will. Other supplies are included to round out your new electric boundary training fence. You will get a test light tool, included wire nuts, and waterproof gel-filled wire splice capsules. Water Proof functionality will help protect and maintain your investment in all weather conditions. Of course you will get all the expert advice you need in the included product manual. This In ground pet fence support unlimited dogs if you purchase extra collar for your additional dogs. You can confine exact that amount of dog in your yard as how many dog collar you have purchased. What Benefits Petsafe Basic in-Ground Pet Fence PIG00-14582? The entire system is designed for a fast do-it-yourself set up. Any dog you have over eight pounds can be trained with Petsafe Basic in-Ground Pet Fence PIG00-14582 system. Dogs often model behavior so the more you have the better it works. The neck collar will help train your dogs with necks from six to twenty-eight inches around. You will get to vary resistance as your dog learns. This will also be of great benefit as you can trained separate dogs based on personality. Petsafe Basic in-Ground Pet Fence PIG00-14582 system provides a way to set the static correction. As your pet learns to respond you can vary the levels of system response. Static correction isn’t the only way your pet will learn. You will also be able to teach with the tone-only mode. The tone-only mode alerts your pet with a sound only. Your pet will hear a beep as an alert when you choose this mode. The great part of having two options is it gives you the chance to allow your pet to become smarter. Of course being an outdoor fence the collar is also waterproof What this allows you to do is let your pet have easy access to your home if you chose. The ease of coming and going in and out also allows your pet to bond with you better. If you have an outside only pet it will easily feel more comfortable within personal territory. The included battery will get you moving fast. Ready to go as soon as you get your hands on the system. The great part about the length is it covers up to five total acres with additional boundary wire which is not included. This can be a con but the system being expandable makes up for it. 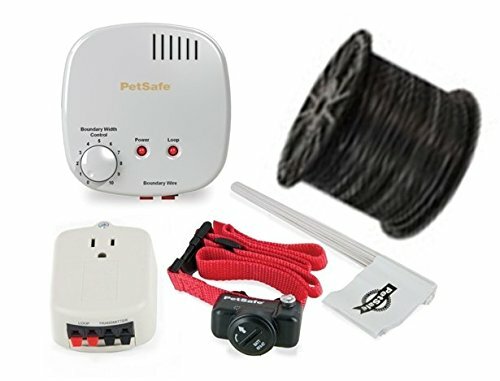 How To Install Petsafe PIG00-14582 wireless dog fence? Designed with speed of set up in mind the Petsafe PIG00-14582 system is easy to set up. Everybody has a busy schedule so it has been designed to be installed over a weekend. The process goes first you set up the transmitter. Then you easily bury the transmitters around the pets area of your yard. Like we said you can cover up to five total acres with additional available flags and wire. Flags are used in place of current or above ground fence to train your pet. Your dog will be able to see the simple to use flags to see where the new yard ends. Petsafe Basic in-Ground Pet Fence PIG00-14582 is designed for use with fun and super quick pet training sessions. These training sessions are meant to teach your pet over the next two weeks. Remember you are not only installing the new system into your yard. You are also installing Petsafe Basic in-Ground Pet Fence PIG00-14582 system into the pet. In typical time and with typical pets they learn quickly. The way it works is your pet will remind your pet with a warning beep. The next step is a safe and super gentle static correction. To wrap up this Petsafe Basic in-Ground Pet Fence PIG00-14582 review you will have excellent coverage and response from your pets. The entire yard of up to five acres can be covered with additional wires and flags. Your dog will respond quickly with the flags, beeps and gentle correction. The best part is you can set it up in only two days. What are you waiting for. Check it out now!